The historic Baths of Lucca or Bagni di Lucca in Tuscany, Italy has been a popular mineral springs spa since Roman times and continues to be an attraction. Bagni di Lucca literally, the Baths of Lucca in Tuscany, Italy has been popular for the mineral springs since Roman times. The area was first mentioned in a document dated from 983 which was a contract, or agreement stating the Bishop of Lucca, Bishop Teudogrimo rented or leased the dwellings and land to Fraolmo of Corvaresi. Known as Bagno a Corsena until 1862, Bagni di Lucca was a favourite resort for the Bonapartes in the early 1800s, especially Napoleon's sister Elisa Buonaparte Baciocchi. The thermal springs can reach temperatures to 37 to 54 degrees Celsius or 99 to 129 degrees Fahrenheit. Bagni di Lucca's hot springs has a natural steam room where the steam comes through the rock walls. It is the only one of its kind in Italy. in Tuscany, Italy in Europe. ... many first class hotels in Bagni di Lucca on the Lima River, in Tuscany, and if visiting on the last Saturday in June, the Medieval Feast is a yearly celebration where there is authentic Tuscan food to enjoy, as well as street entertainers of all kinds. 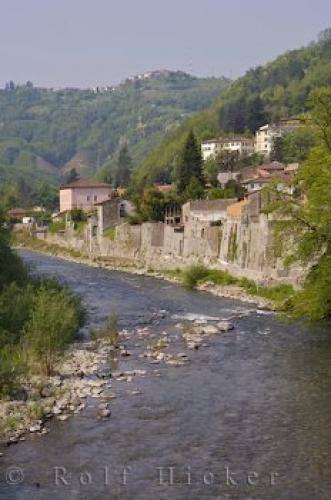 Torrente Lima, Lima River, from a bridge in Bagni di Lucca, Tuscany, Italy, Europe. I photographed this photo with the digital SLR camera model Canon EOS-1Ds Mark II, aperture of f/6.3, exposure time of 1/250 sec. on ISO 200, as always I used a original Canon Lens, the focus lenght for this picture was 70mm.